Shoppers in Belarus may soon be tempted by new breeds of potato with luridly blue and pink flesh, it's reported. It's all part of a wider national effort by Belarusian scientists to develop new kinds of spuds with non-traditional colours, the Minsk Novosti news website says. 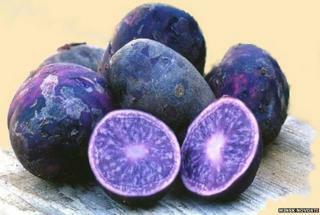 There'll be blue, pink and purple potatoes that will taste as good as the more common white-yellow ones, according to Ivan Kalyadka, who heads the Research Centre for Potato Cultivation and Horticulture at the Belarusian Academy of Sciences. Now that the nine-year breeding process is complete, the new kinds of potato are currently undergoing state testing. After that they'll be given the green light for full-scale cultivation, the report says. Their creators hope to use them in a variety of products, including crisps, chips and instant mashed potatoes. The potato is central to Belarusian cuisine, used in dishes such as draniki (potato pancakes) and babka (potato bake). Non-traditionally coloured spuds have in fact been developed elsewhere, including the "Adirondack Blue", bred by potato breeders at Cornell University in the US. It's not known whether the new Belarusian breeds are similar to existing types, or entirely new creations.